Piitu is now 14 months old and has been taking lessons in agility, obedience and everything they actually arrange for dogs. It may sound like we are too demanding, but she just loves school and loves to perform. Sunday we were showing her officially for the first time. In a conformation show, judges familiar with specific dog breeds evaluate individual dogs for how well they conform to published breed standards. Correct head. Good proportions. Well set and carried ears. Good sized, well set apart eyes. Back still not enough strong. Still needs more chest and forechest. Free elbows. Correct rear legs. Tail set little bit too high. Free movement. Steps a bit inwards in rear legs. Nice temperament. Needs more practise for the show. 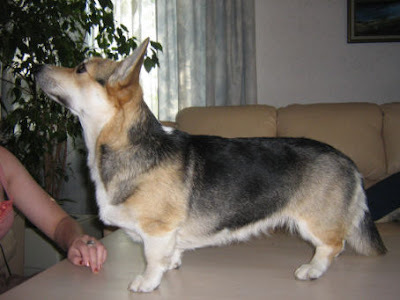 She also got the title ”Best Junior” among Welsh Corgi Pembroke's, but there was not actually much competition. We knew very well about the need for practice. Piitu really gave the best act she can. She is so wild that we were sure she could not stay still as long as needed. The picture was taken the next day and it took several attempts before we could get a good pose. Piitu is a Welsh Corgi Pembroke. It's a very old breed made famous by Queen Elisabeth II. Corgis are shepherd dogs; they are very fast and they have the habit of driving cows by biting them by the ankles. Since they are so small they don't get hit if the cow kicks!